Over the Easter weekend onions seemed to be my nemesis. I know, I know, the sharper your knife and all that, but as I prepped leeks, and shallots and cippolini onions for various meals it wasn’t pretty. My chopping skills were actually not bad (thanks Dirty Apron Knife Skills Class!) it was more the fact that I forgot to put on my mascara until after I had finished my prep and looked a bit like a horror movie racoon. It got worse from there. I seemed to forget a lot that weekend. I prepped cippolini onions for the barbeque one night but forgot about them until the next day, I had to deconstruct an entire dauphinoise because I realized I had neglected to spread the leeks in between the layers and I forgot to buy several ingredients (that were on my list!) that forced me to change my menus at the last minute. It’s a good thing my friends and family (seem to) like me. They don’t mind hastily reapplied makeup and they don’t seem to mind last minute menu changes. With only two of us at home we can (and should!) only eat so much. I therefore tend to try out a lot of new meals on guests (hint: this is usually not the recommended time to attempt a new recipe). So far there have been no rebellions. Despite my penchant for obsessive planning and list making, things still do happen. Ingredients get forgotten, cooking skills are lacking, taste buds don’t get appeased. Sometimes though, good things come from mistakes. Easter dinner was one of those times. I had carmelized onions for a dish the day before, but had decided at the last minute not to include them, so they were just sitting there looking lonely. As I was trying to decide what to dress the asparagus with those poor little onions caught my eye. Just like that, a new dish was born. 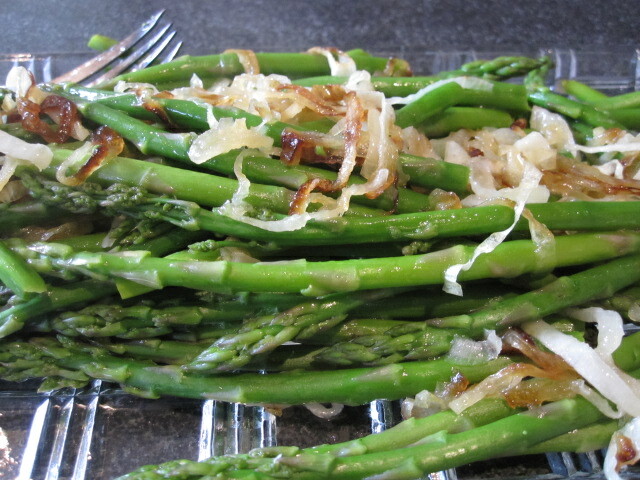 A beautiful, earthy tasting taste combination of olive oil, melted onions, fresh spring asparagus and a hint of lemon. I know that the potential variations to this are endless but, as with so many things, because of one little mistake something new was born and can continue to grow. First, carmelize the onions. As I’ve learned, this can be done a day or two in advance. 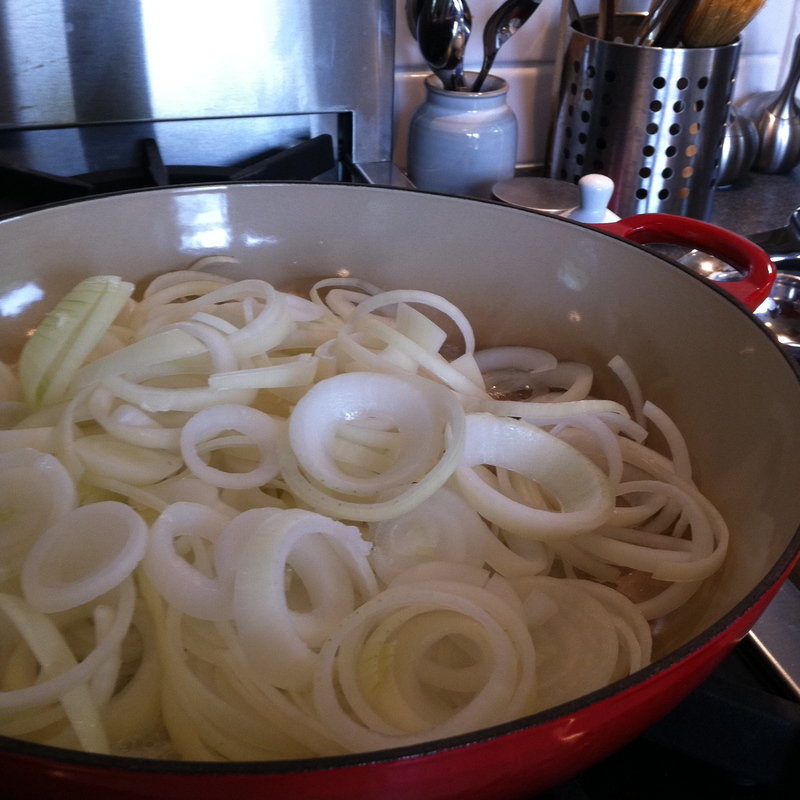 I’m not going to spell out how to carmelize onions here as there are lots of great resources for that. Two great resources to try for step by step instructions are Simply Recipes (there’s even a video!) or Michael Ruhlmans book Twenty . Next, steam your asparagus. Remember that crispy will always taste better than smooshy (that’s a technical term). 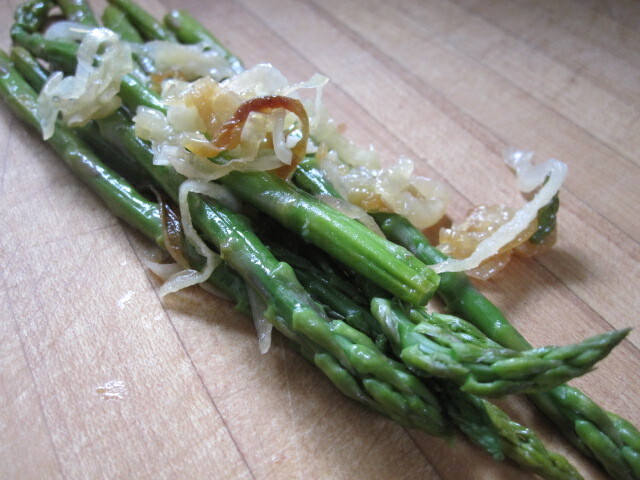 When the asparagus is done, squeeze the lemon juice over it and toss with the onions. Season to taste with salt and pepper. For an added zing put a dab of fresh goats cheese, some fresh ground thyme or even some preserved lemon on top. Enjoy a nice taste of spring. Ideally, with friends. This entry was posted in Cooking, Easter, Food, Herbs, Recipe, Vegetables, Vegetarian and tagged asparagus, cheese, cippolini onion, lemon, olive oil, onion, sea salt, spring by mostlynoodles. Bookmark the permalink. yum I had the pleasure to eat it too.